Hello everyone, I am Ismael Lizárraga, a Software Engineering student at Tecnológico de Monterrey in Guadalajara, Mexico. 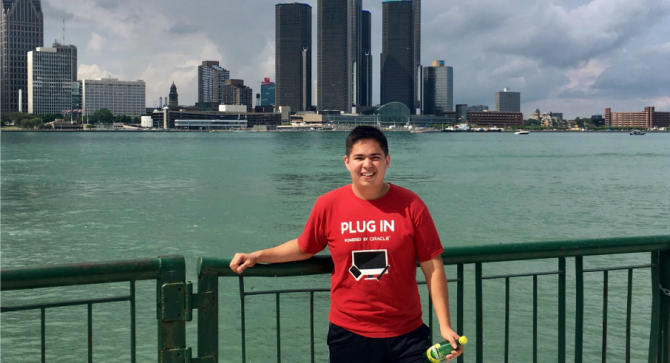 I arrived to Canada this past month to start working as a Mitacs Globalink Researcher at the University of Windsor EPICentre. I will be working here conducting research on the Social Innovation Ecosystem at the University of Windsor. During the summer, I will be sharing with you a series of blog post telling you about my experience in Canada. Since this is my first post, I would like to start talking about how I became interested in entrepreneurship and social innovation. At fall of 2016, I was starting my 3rd year of studies when I was selected to participate in the Honors Social Entrepreneurship Program at Tecnológico de Monterrey. In this program, I was able to take the Social Entrepreneurship course as well as participate in extracurricular activities for this program. 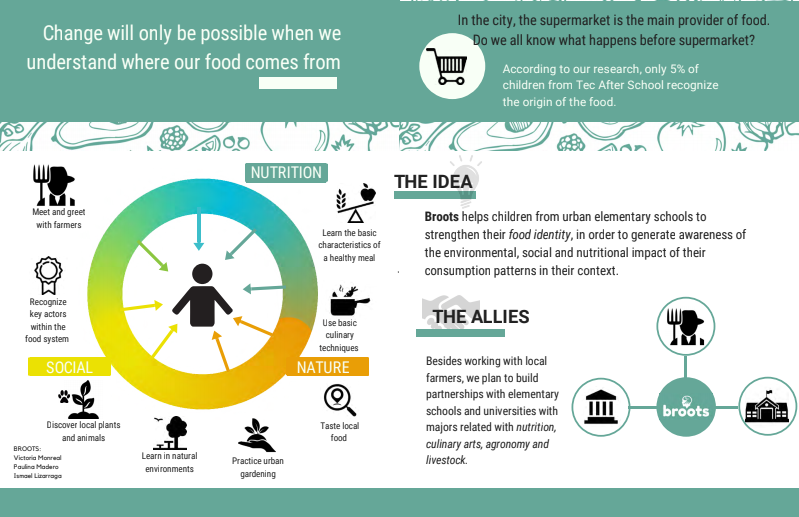 During my time in this program, with two classmates we started to develop Broots, a social venture that helps children from urban elementary schools to strengthen their food identity, in order to generate awareness of the environmental, social and nutritional impact of their consumption patterns in their context. During that semester, we got the chance to start researching about the social problem that we were addressing as well as running our first market validations with groups of elementary school students. We built a first idea of business model for Broots and pitched it at the end of the semester. After that, we got invited to join the Social Entrepreneurship Hub at my University to keep working on developing Broots. In the following picture, you can read an infographic that explains what we were trying to accomplish with Broots. We started the program at the Social Entrepreneurship Hub in the winter semester of 2017, during the year-long program, we got the chance to have mentors, keep developing or social value proposition as well as perform market validations in different schools with both students and professors and even applying to some competitions to obtain funds for our project. During the winter semester of 2017, I got into TecLean Accelerator at my University with a group of friends with the idea to found a B2B e-commerce startup, we had workshops, mentorships and different opportunities to pitch. 2017 was a year in which I was fully involved in entrepreneurship activities and I really enjoyed being part of that, I can say that it was one of the most productive and exciting times that I’ve ever had. I started to applying to the program that got me here around August of last year and when I was selecting a project to apply for I didn’t doubt of looking for opportunities to keep exploring the field of entrepreneurship and social innovation. That is why I am so happy and excited that I got selected to participate in this project at EPICentre. I firmly believe that through entrepreneurship and innovation we can create better communities and I am happy to collaborate for that here at Windsor-Essex. I will be writing more about my stay here in coming posts, so I’ll keep you updated on my EPIC Journey to Canada.